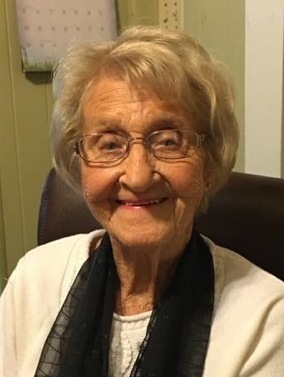 Ruth White affectionately known as “Mimi” to those who loved her, 98 of Paoli, passed away peacefully on Thursday April 11, 2019. She was surrounded by her loving family during the last few weeks of her life. Ruth was born June 29, 1920 to the late Leonard Alonza and Josephine (Cecil) Bennett. Along with her parents, she is preceded in death by her husband of 64 years, Elwood “Woody” White; her two sisters Lois (Howard) Stout, and Viola (Cecil) Lanham, two grandchildren Brian White and Rebecca Ott, one great-grand child Ashley White,and one step-granddaughter Mykala Morin. A baptized believer, Ruth was a member of Old Union Methodist Church, where she worshipped until her health failed her. Ruth left behind cherished memories to all seven of her children: JR (Becky) White, of New Albany, Indiana; Norma Spalding, of Paoli, Indiana; Frank (Connie) White of Sellersburg, Indiana, Anita (Lawrence) Myers of Paoli, Indiana, Steve (Diane) White of West Baden, Melody (Larry) Morin of Bedford, Indiana; Joe (Rita) White of Paoli, Indiana; Caregivers: Mary Patton and Barbara Mosson of Paoli, Indiana. Her grandchildren are David (Beth) White, New Albany, Indiana, Lisa (Stan) Ryba of Tabernacle, New Jersey, Michael White of Louisville, Kentucky; Lieutenant Colonel Jonathan (Bethany) Ott of Fort Bragg, North Carolina, Velvet (Michael) Kee of Georgetown, Kentucky, Todd (Natalie) White and Tracy (Larry) Fullerton of Sellersburg, Indiana, Jennifer Myers (Alan Veach) of Bloomington, Indiana, Jacqueline Myers of Conroe, Texas, Jeremy (Carri) White of Jeffersonville, Indiana, Erin (Ryan) Betz of West Baden, Indiana, Timothy Chastain of Bedford, Indiana and Josie White of Sellersburg. Ruth also has 34 great-grandchildren and 7 great-great grandchildren. Ruth grew up in a small town, Fargo, just outside of Paoli that is no longer on the map today. She went to Bennett School #7 in Fargo. Like most kids of the times, she walked to school each day regardless of the elements. Her father, Leonard passed away in 1935 at the age of 48, Her mother Josephine, decided to move into town of Paoli after that. Ruth then age 15 entered Paoli High School. She loved school and was a very good student. On her way home from school one day a young man approached her his name was Woody White, and he worked at the Mineral Springs Hotel. Woody was an entertainer noted for his piano playing abilities. He also had a radio program. Smitten by Ruth, he kept asking her for a date. She was equally smitten, and she said yes. They were later married on March 28, 1937. They were married for 64 years until his death in November 15, 2002. Ruth had a love for music and a beautiful voice. She was blessed with the music ability to “yodel”. Which is a dying art of today. She joined their five-piece band, “The Hoosier Hot Shots” with Woody, for a year, but stopped performing when they started a family. During World War II she went to work at Indiana Army Ammunition Plant between Charlestown and Jeffersonville, Indiana, as so many did in those days to help make army supplies for our service men and women. Ruth in 1953 took on a new roll in life, with the passing of her mother-in-law Maude, she became a full-time caregiver to Elvet, Woody’s father. After remodeling Woody’s boyhood home at the family of 7 moved in. As time passed 2 more children blessed the home. This was Ruth’s home as of today’s passing to her heavenly home. By today’s standard Ruth is amazing, with a large family, Ruth never had an automatic washer, dryer, dishwasher and still doesn’t nor leaned to drive a car. LOL but tried once. Ruth loved gardening and her beautiful flowers. She always found time for her yard to be showplace for everyone. She loved her birds, most of all she loved the “hummingbirds” they were her favorite of all. She truly was fascinated with them. Ruth loved to cook, just good down to earth country cooking. Beans and cornbread, fried potatoes and bologna salad etc. It didn’t matter what she cooked; it was good. She once said, she has a “secret ingredient”, later we found out it was “sugar”, Ruth put sugar in everything. With 7 children each had their favorite dish of course. Ruth’s Blue-Ribbon Persimmon Pudding was tops with all. Ruth later in life, tried her hand at ceramic, and was very good at it. Several of us still have the gifts she made us. Ruth became a fashionista, in her later years, said if your mind thinks you are 60, ditch the 90 plus year birth certificate. “90 is the new 60’s”, LOL and that was our mom. Ruth loved to travel and did so later in life, some high spots were Myrtle Beach and the Cancun to name a couple. Ruth said, however, her greatest “accomplishment would be her children. She was a great encourager, who family and friend say, always had time to listen and share her wisdom. Funeral Services will be 1:00 P.M. Tuesday April 16, 2019 at the Dillman-Scott Funeral Home. Interment will follow in the Old Union United Methodist Cemetery, 5293 N CR 10 W, Orleans, Indiana. Visitation to be held Monday April 15, 2019 from 4:00 P.M. to 8:00 P.M. and from 9:00 A.M. until time of service on Tuesday at the Dillman-Scott Funeral Home, 226 West Campbell Street, Paoli, Indiana. Pallbearers are, David White, Todd White, Michael White, Jeremy White, Michael Kee, Joe White and Timothy Chastain.